“Geoconfederacy: Bartram’s Archipelago.” Cambridge History of Literature of the U.S. South, ed. Harilaos Stecopoulos. Cambridge University Press, forthcoming 2019. “Superfly: François Makandal’s Colonial Semiotics.” American Literature, forthcoming 2019. “Electric Dialectics: Delany’s Atlantic Materialism.” Ecological Form: System and Aesthetics in the Age of Empire, eds. Nathan Hensley and Philip Steer. Fordham University Press, 2018. “Insect Poetics: James Grainger, Personification, and Enlightenments Not Taken.” Early American Literature. Volume 52, Number 2, 2017. “The Geopolitics and Tropologies of the American Turn” in Turns of Event ed. Hester Blum. University of Pennsylvania Press, March 2016. “Toward a Figurative Materialism: A Slight Manifesto.” English Language Notes Vol 51, No 2 (Fall/Winter 2013). 61-77. Ariel’s Ecology: Personhood and Colonialism in the American Tropics, 1760-1820 (University of Minnesota Press, 2013). “Under Water.” With Michael Ziser. American Literature Vol 84, No 2 (June 2012) 233-241. “Swamp Sublime: Ecological Resistance in the American Plantation Zone.” PMLA 123 (2008) 340-357. 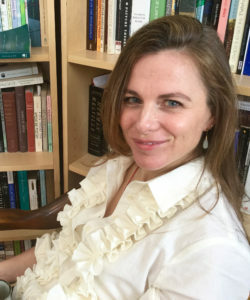 Professor Allewaert’s research integrates literary analysis with political and environmental theory to contribute to an American studies that attends to the flows and structures of colonialism that shape the Western hemisphere. This hemispheric orientation of the field develops through sub- and supra-national frames and problematics in an effort to uncover understandings of personhood, community, place, and aesthetics that were overlooked by earlier organizations of the field. 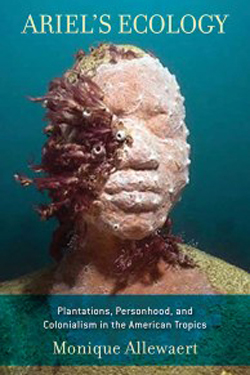 Her book Ariel’s Ecology (University of Minnesota, 2013) argues that in the American plantation zone human bodies were experienced and mythologized not as integrated political subjects but as bodies in parts. She investigates how this experience and mythology of the body shaped art forms of the period, particularly Anglo European and Afro American travel writing as well as Afro American oral stories and fetishes, considering also the implications of this experience of the body for personhood and political life. Allewaert is completing a second book, Insect Luminescence, that focuses on insects, which were ubiquitous in the tropics and for this central to colonial knowledge production and aesthetics. She argues that denizens of the tropics’ insect knowledges and aesthetics constitute a minoritarian Enlightenment tradition that can be put into productive relation to twenty-first century environmentalism, politics, and aesthetics. Allewaert has several other projects underway, ranging from a Plantationocene Sawyer Seminar with Pablo Gómez, Gregg Mitman, and Sophie Moore to a study of the collation of environmental and colonial catastrophes in the eighteenth century Americas to eighteenth and nineteenth-century Atlantis mythologies. She has served on the editorial board for American Literature (2014-2019) and is currently on the editorial board of Resilience. Allewaert’s scholarship and teaching derive from a belief that literature can inspire teachers and students to see and experience the world anew. She has developed and taught over a dozen different courses in literature and theory that range from large lectures to small seminars, from introductory courses for freshmen and sophomores to graduate seminars. Her undergraduate classes include American Literary Cultures (English 243 the large lecture-format American Literature course), Literature and Culture 2 (English 242, the large lecture-format requirement for the English major), Introduction to Poetry, as well as courses on topics relating to colonial American literatures, literature and the environment, literature and science, literary figuration, American agencies, and seminars on the work of Phillis Wheatley, Edgar Allan Poe, Herman Melville, and Emily Dickinson. Her graduate courses include seminars on transatlantic and creole ecologies and aesthetics, literary figuration, conceptions of agency from the eighteenth century to the present, and the plantation complex. Her next new graduate offering will be a seminar on eighteenth and nineteenth-century American spiritualisms and other (pseudo)sciences. Monique Allewaert. Ariel’s Ecology: Personhood and Colonialism in the American Tropics, 1760-1820. University of Minnesota Press, 2013.